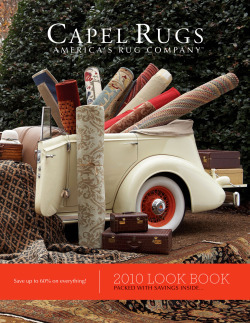 TROY, North Carolina (28 April 2010) - Capel Rugs has unveiled its 2010 Look Book, the company's first-ever consumer direct catalogue. Focusing on price, value and variety, the publication offers both Canadian and U.S. retailers a customizable way to reach new ready-to-buy audiences. The 48-page, full-colour catalogue presents more than 100 of Capel's best-selling rugs including contemporary, traditional, casual, eco-friendly, outdoor and kids' collections. There is a strong consumer incentive to purchase with prices up to 60% off the suggested retail throughout the book. "At Capel, we are committed to supporting our dealers," Capel vice president of sales Allen Robertson said in a statement. "We developed our 2010 Look Book as a way to enhance the consumer experience and facilitate communications between consumers and retail stores." To aid retailers in their own marketing plans, the 2010 Look Book can be distributed as a direct mail piece to consumers, designers and other prospects, and as an in-store and trade show takeaway. Retailers can also customize the back cover of the catalogue with a logo, store contact information and additional sales incentives such as a coupon. The catalogues are available to all Capel retailers through the end of 2010.